It’s Hip to Tap Squares: Touch the small boxes—each of which represents a four-count beat—to make music with Melodica. Melodica presents you with a screen of small boxes which you touch to activate. These boxes essentially represent a four-count beat with 10 different tones to play. Once you activate a box, it lights up and plays a note in the sequence. Touching other boxes builds up the notes in your tune until you have a full sound and a cool looking light show. You’ve got three tempos to choose from in Melodica—slow, normal, and fast. 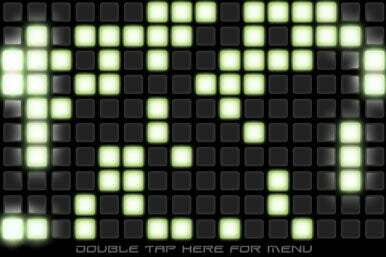 If you want to start over, just shake the device to clear the board. Once you’re finished, you can save your creation and listen to it later. Unfortunately, you can only create a four-count beat—that’s it. There’s no way to extend the timeline and make a full-length song. This shortcoming really cripples an otherwise fun and creative app since listening to the same four-second loop gets old really quick. Also, Melodica has only one preset of sounds to use, with no way to export your music for sharing. There’s a great idea behind Melodica. But the app needs some updates to move from short-lived entertainment to outstanding app. Melodica is compatible with any iPhone or iPod touch running the iPhone 2.2 software update.